At Grades of Green, we are often asked if our lunchtime waste reduction activity can be successful at bigger schools, such as middle schools. Great news – schools with a high student population can make a big dent in waste reduction! 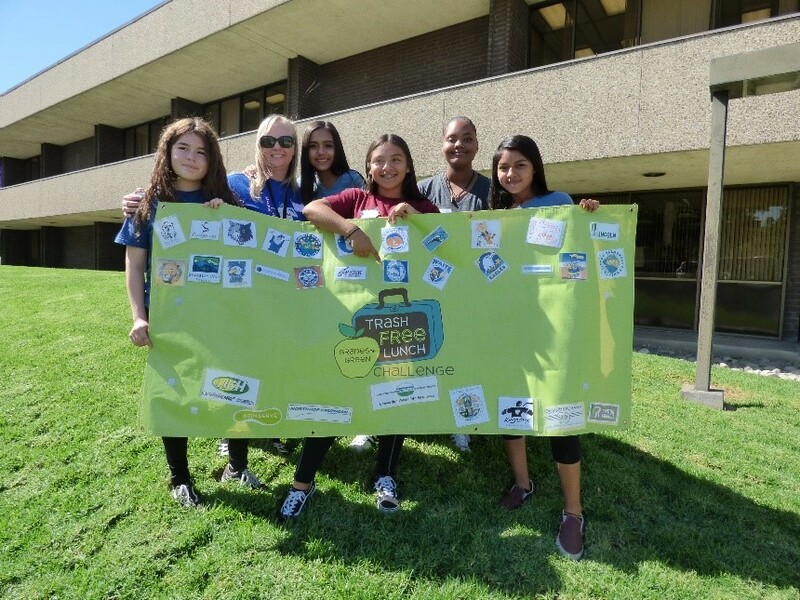 Los Angeles middle schools participating in our Trash Free Lunch Challenge, such as Robinson K-8 Academy from Long Beach Unified School District, constantly remind us that all kids have the potential to care for the environment no matter what their age. Robinson K-8 Academy started off the 2017-2018 school year with approximately 1,000 students generating sixty bags of lunchtime trash. After a school-wide assembly demonstrating Robinson K-8 Academy’s new waste sorting system, the school worked together as a community to decrease their lunchtime trash. The Female Leadership Academy students championed the effort, and helped form a Grades of Green Team. The student leaders taught peers where each lunchtime item went between a donation box, liquids bucket, compost bucket, recycling bin, and landfill bin. They even trained their younger elementary school level Grades of Green Team members how to be waste sorting monitors. At the end of the day, the entire Robinson K-8 Academy Grades of Green team helped their school reduce its lunchtime trash from sixty bags down to just seven! That’s a whopping 88% waste reduction in just one day. Interested in signing up your school for an eco-competition? Click here to learn more about Grades of Green’s Spring 2018 Water Challenge, and email us at [email protected] for more details!